What is an editorial? Newspaper editorials reflect and express the newspaper?s opinion on an issue. Editorials are opinion stories, but in order for an editorial to be effective, it must be backed up not only by an opinion but also by facts and evidence, and in many cases the editorial will also include relevant data. 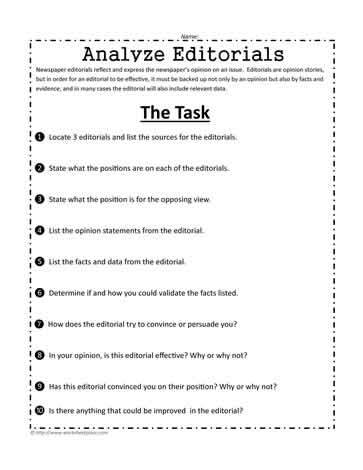 ❶ Locate 3 editorials and list the sources for the editorials. ❷ State what the positions are on each of the editorials. ❸ State what the position is for the opposing view. ❹ List the opinion statements from the editorial. ❺ List the facts and data from the editorial. ❻ Determine if and how you could validate the facts listed. ❼ How does the editorial try to convince or persuade you? ❽ In your opinion, is this editorial effective? Why or why not? ❾ Has this editorial convinced you on their position? Why or why not? ❿ Is there anything that could be improved in the editorial?